Have you ever wondered what life would be like in Ancient Britannia in the 1st Century CE? Or how the British Celts felt about the invasion of the Romans and the political unrest that ensued? Apollo’s Raven is insightful and informative historical novel from new American writer Linnea Tanner. It paints a picture of Ancient Britannia and the ruling structure of the Celtic tribes, an antithesis of what made the Roman Empire powerful and dominant dictators. The main character, Catrin, a Celtic Warrior princess, becomes entangled in a treacherous web of lies and learns of curse of which she is the key to prevent the downfall of her people. Or perhaps, is the cause of their demise. Catrin falls in love with a Roman, and sets off chain of events that not only jeopardises the fate of her life, but also of her people. She must decide whether to save her family and tribe, or the man she loves. This is a historical novel/fantasy with a strong romance theme, a forbidden love story between a Celtic princess and Roman, Marcellus, who accompanies his father, Senator Lucius Antonius, to Britannia by the order of Emperor Tiberius. Apollo’s Raven is told from the point of view of Catrin, and in some parts, Marcellus. Catrin is portrayed as a strong yet vulnerable character who is struggling to accept her ability as a druidess, which comes to fore as the story progresses. Her vulnerability comes through as she finds herself attracted to the handsome and confident, Marcellus, and struggles to deny her feelings for him. A great deal of research is evident in the story, from the culture of the Celtic way of life, to that of the Roman military structure. Each historical element has been treated with care and diligence. I am not familiar with Celtic history and was fascinated to read about the hierarchical structure and how much power women, in particular the queen, had within the Celtic tribe. I also loved the fact the women were trained to fight with swords and the bow and arrow, and how to ride a horse and a chariot. A contrast that was described very well when Senator Lucius Antonius has a meltdown on having to meet and discuss political matters with a ‘woman’. The romance angle is an intriguing and effective plot as it gives the central characters’ purpose and motive to find a way to be together, in spite of their differences and allegiances. Yet, the question remains, will their love truly test the arduous trials that they will face? Is it cliched? I guess it is but in the context of the story it works well, and we do want to learn how and what Catrin and Marcellus will do to prevent a war and, if they will find each other again. What I also liked about the story was the reference made to Mark Antony, the general who fell in love with Egyptian Queen, Cleopatra. Marcellus and his father are the direct descendants the Antonius family, a black stain, Lucius seems to be intent working hard to remove. It appears another Antonius is about to fall in the same trap, loving a foreigner and a royal personage. Could history be repeating itself? From a historical perspective, Apollo’s Raven is a good introduction to what life was like for the Celtic Brits when the Romans invaded. The plot is intriguing, and the forbidden love angle adds to the punchiness of the story. A particularly enjoyable read. This sounds excellent. Sounds like a great blending of two civilizations. I just put it on my wish list. It’s time is coming! Thank you, Luciana, for your review of Apollo’s Raven and gracious support. It has been such a pleasure to know you as a friend and to share our love of ancient civilizations and mythology. 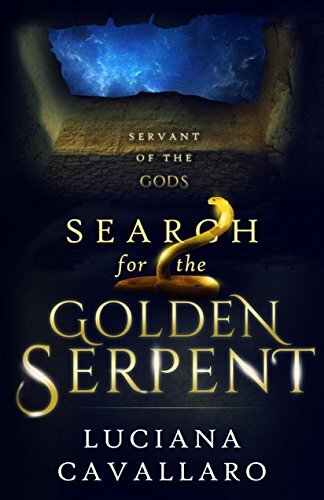 Best wishes on the release of your second book in the series, Servant of the Gods, that weaves history and mythic fantasy into an epic adventure. I’ve reached out two editors and yet to hear back from them. 😦 A bit of a delay as to the publication of book 2. I wish you the very best in the publication of your next book. Look forward to reading it. Thanks again for your support and friendship. It is a pleasure to reblog the Book review of Apollo’s Raven posted by Luciana Cavallaro–an Australian historian and exciting author whom I follow. Be sure to check out her website and blog. I am rather liking the sounds of this. Oh all right. TBR pile here it comes. My TBR pile is beginning to look like the Leaning Tower of Pisa! Wonderful review! Just downloaded Apollo’s Raven to my Kindle!